1, There is an ancient saying that less salt and more vinegar, the path to longevity. 2, Hawthorn could improve metabolism, regulate PH level as well as relieving tiredness. Fruit vinegar contains over 10 types of organic acid and multi-amino acids the human body needs. Besides, the Ka, Zn in hawthorn vinegar could transfer into alkaline material after metabolism, preventing blood acidic, thus regulating PH level. 3, Hawthorn vinegar could eliminate tiredness. After long time working and vigorous activity, human body will produce large lactic acid, which could make people feel tired. If increasing the hawthorn vinegar supply at this time, the body metabolism could be quickly recovered. 4, Hawthorn vinegar could lower cholesterol. The study confirmed that the cardiovascular-disease patients could reduce cholesterol by average 9.5%, neutral fat by 11.3% as well as lowering blood viscosity by consuming 20mg hawthorn vinegar per day for 6 months. 5, Hawthorn could promote blood circulation, lower blood pressure. Hawthorn vinegar can also expand blood vessels, increase coronary blood circulation. Triterpenoids and flavone lowering blood pressure has curing effect on various diseases such as high blood pressure, high cholesterol, cerebral thrombosis and arteriosclerosis, etc. 6, Hawthorn vinegar could improve digestion, anti-alcohol, protect liver, and improve immunity, as well as anti-cancer. The acid material in hawthorn vinegar could dissolve the nutrients in food, improve the intake of nutrients such as Ca and P. The Nonvolatile Organic Acids and amino acid could stimulate the appetite center in brain, improve the secretion of digestive juice, thus increasing the gastric fluid concentration, produce saliva and slake thirst, improve digestion and appetite. Clinic reported that drinking hawthorn vinegar after dinner could accelerate the alcohol metabolism, thus hawthorn has anti-alcohol functions. “Compendium of Materia Medica” said vinegar could remove blood congestion, cure choleplania, improve appetite and nourish liver. Regular consuming vinegar and brown sugar could cure liver disease. 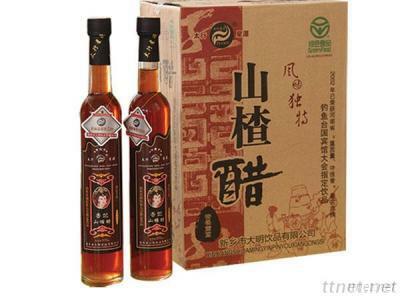 7, Hawthorn vinegar has the function of anti-bacteria, anti-inflammation and preventing influenza. 8, Hawthorn vinegar could also develop intelligence. The volatile substance and amino acid could stimulate brain never center to develop brain development. Medical study discovered that the PH level in brain is related to the IQ. Children with alkaline material in brain have higher IQ than those with acid materials. Food & Agriculture, Beverages & Drinks, Beverages & Drinks/n.e.s.